New Delhi: Oil Marketing Companies (OMCs) have released 3.25 crore new LPG connections during FY 2016-17. This is the highest ever number of LPG connections released in a financial year so far in the LPG history of the country. 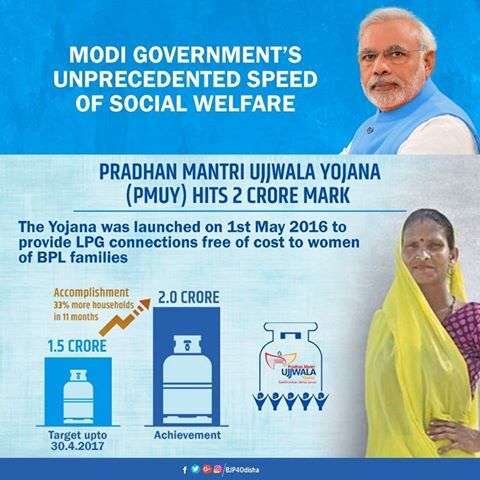 The connections released includes 2 crore connections released under Pradhan Mantri Ujjwala Yojana (PMUY), which was launched on 1st May 2016 by Hon’ble Prime Minister and 1.25 crore connections to new consumers other than PMUY beneficiaries. Under PMUY, women of BPL families especially residing in rural areas have been given LPG connections. This increase in connections has resulted in a jump in the LPG coverage and as on 01.04.2017, the national LPG coverage is estimated to be 72.8% with 19.88 crore active consumers.